I do not get any options at all to open the URL in new window (or same window), in the browser context menu (both IE and Firefox). A: No, Deluxe Menu doesn't have such a feature. This is only text, not alink. And we won't change it. 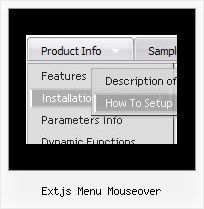 Because now you're able to paste anyhtml code within menu item. Q: Is there a way to make the vertical drop down menu dhtml not reset after a link is clicked. Now every time I click a link in the tree menu it takes me to the linked page but all the menus re-expand. A: When user clicks the link, the browser loads a new page and the script re-create the vertical drop down menu dhtml. Problem with Mouseover in Flash Movie · Text won't appear... ... Flash CS 3 Auto format problem · Flash menu in a php site · What am I doing wrong? What's so great about components? menu bar component ... Using the Cell Renderer ...mouseover effects · 4 comboboxes, Submit and Reset: Flash form to HTML?